← The Carnival of Trumpet! 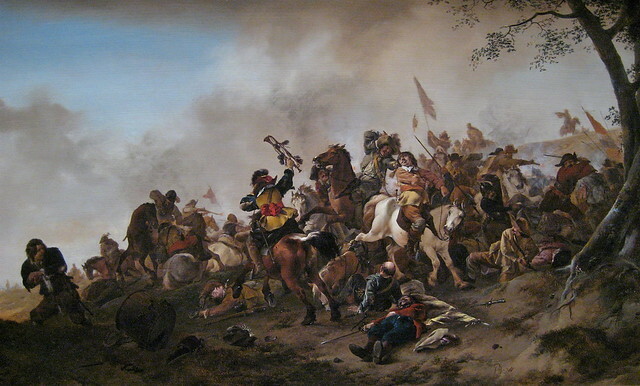 Image | This entry was posted in The Gallery, The Trumpet o-iii<O and tagged battle scene, dutch, oil, Philips Wouwerman, Trumpet. Bookmark the permalink. I don’t know Brendan, but I recently found out from my father that a long ago great, great, great grandfather was a bugler in the Boer War who was decorated by the Queen of the time and while at Buckingham Palace spotted a gypsy laundry woman resulting in marriage and on and on..I believe his surname was Courtney?? So maybe I’ve gypsy and brass in my blood? My father is not too clear of the details but it’s a kind of romantic notion from a brass player point of view..
Lovely painting! It looks to be in the style of Rubens, but I have never seen the original. I’m pretty sure it is 17C Dutch, anyway. Don’t know if that helps at all.